It’s Christmas time and Christmas is a time for indulgence. For me, that means only one thing. Food. It’s been a pretty tough year for me in lots of ways, so TBH has really pushed the boat out and decided to take me to the number one restaurant on my bucket list. The Square. Phillip Howard has been at the helm of The Square for twenty years and while many of his contemporaries have moved into the role of celebrity TV chef, Phil has steadfastly remained in the kitchen. It is only this year that he has made an appearance on The Great British Menu, won the London region of the competition, and released his first cook book. (Aptly named The Square by Phil Howard) The restaurant has won a whole host of awards including 2 Michelin stars, which I think is largely due to the fact that Phil Howard is a constant presence and has a vested interest in how his restaurant is run. The restaurant is modern with muted colours, parquet flooring and bright pieces of modern art. We had a great table in the corner overlooking the whole restaurant. Our booking was early on the Sunday before Christmas so I was expecting it to be quiet, but the restaurant quickly filled up with a real mix of people – families with small children, fathers and sons, first-daters. It made the atmosphere a lot less poncy than I was expecting it to be. So onto the food. We were presented with the menus and the wine list (all 80 pages of it!) While we decided they brought some canapés which consisted of a foie gras cornetto; squid ink crisps with taramasalata and cod croquettes. All were excellent and I particularly like the taramasalata, which is unusual as I don’t really like the shop-bought variety. This wasn’t that garish pink colour and a lot more subtle in flavour. An amuse bouché of cauliflower and chicken consommé followed. Silky smooth cauliflower with a little golden sphere of chicken in the centre, topped with brioche crumbs for texture. Another gorgeous dish. If these were the little extras I could not wait for the food I was about to order. I ordered the signature dish to start. 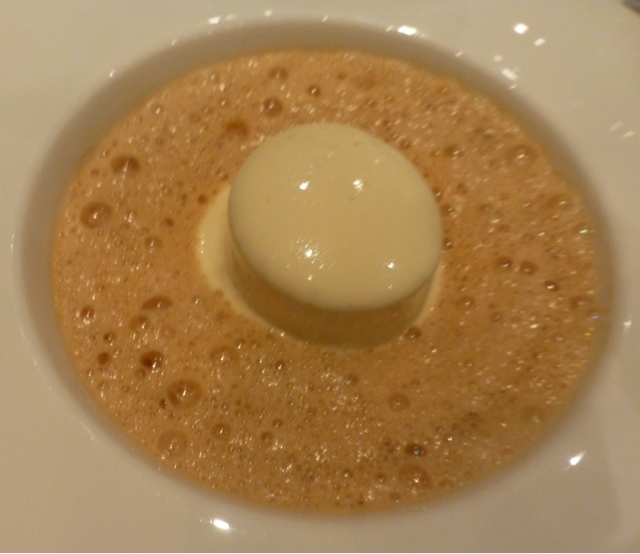 Lasagne of Dorset crab, with cappuccino of shellfish and champagne foam. The pasta was perfectly al-dente and tightly packed with crab meat. The shellfish cappuccino was rich and full of flavour. TBH ordered the Hand rolled macaroni with sticky chicken wings, new season’s mousserons, cauliflower and vacherin. I had a small taste of the chicken and it was tender and juicy and boneless! Not your ordinary chicken wing. We both chose the same main course. Loin of Fallow Deer with a crisp potato galette, pumpkin, chestnuts and trompettes de la Mort. Christmas on a plate! The picture is pretty awful and does not do the dish any justice – sorry about that!The meat was quite possibly the most tender piece of meat I have ever had, the gallete was like a little Swiss roll of the finest slices of potato. The pumpkin adding a lovely sweetness to the dish. Everything was perfectly seasoned and brought together with a wonderfully rich sauce. Faultless. After our main course came a pre-dessert of Greek yoghurt with a mango jelly and a doughnut. It was sharp, but the mango stopped it from being unpleasantly so. The doughnut was crispy on the outside and as light as a feather. A nice little palate cleanser. I chose the milk chocolate bar with salted peanuts, praline and banana for my dessert. The chocolate bar was the smoothest ganache, the saltiness in the caramel perfectly balanced. It came decorated with a little gold leaf that added that little bit of decadence to the dish. 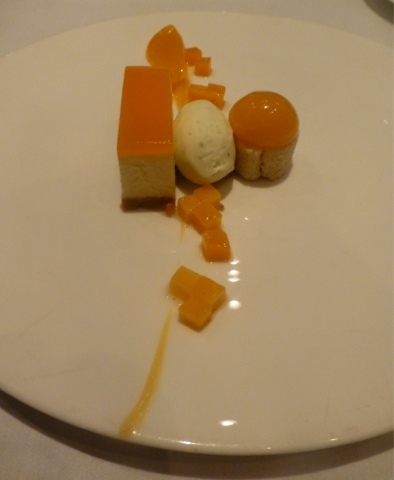 TBH chose the Brillat-Savarin cheesecake with mango, passionfruit and lime. I’m told this was as refreshing as it looked. And then there was more…While waiting for the bill, we were brought chocolate and salted caramel truffles and a selection of sweetshop lollipops. I would’ve been happy with just the truffles, but I ate the lollipops none-the-less. Service was friendly and relaxed and I have to make special mention of Julien, the restaurant manager and Mohammed, the sommelier. Both absolutely charming and made us feel totally at ease. They didn’t even turn their noses up when TBH ordered beer with his food! Some Michelin starred restaurants take themselves too seriously and service can be stuffy, but with these two people on the the team and absolutely stunning cooking coming out of the kitchen, Phil Howard can’t go wrong! We had 3 courses for £80, 2 glasses of champagne, 2 glasses of wine and 2 beers. The total bill came to £255.94 and included service. Expensive, but worth every penny. For me, this was my favourite meal of 2012! Next on the cards is lunch at Roganic in early January, which is a 2 (and a bit year) pop up by Simon Rogan of L’Enclume.